Working with found materials and constructed forms, Huma Bhabha reworks the familiarity of everyday objects into creepy inventions. Something between a primitive species and space alien, her Untitled is both ghastly and sympathetic. 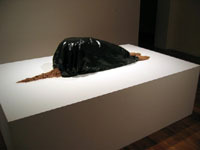 Set atop an altar-like plinth, Bhabha’s figure prostrates in submissive position. Shrouded in black, hands outstretched as if in prayer, it echoes humility and reverence; its aura of calm perversely interrupted by a rigid tail trailing out from behind. 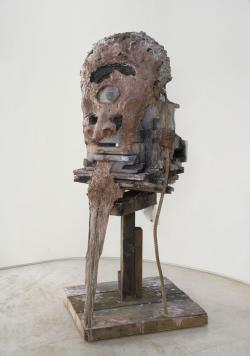 Humorously referencing both tribal masks and modernism, Huma Bhabha’s Museum Without Walls presents the anatomy of a sculpture as voodoo construction. 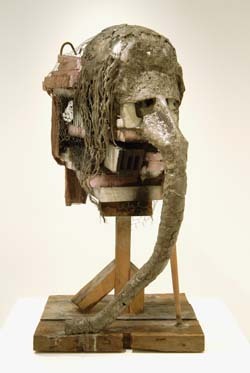 Using the traditional materials of sculptural moulding Bhabha constructs a skeleton of process, her formalist assemblage doubling as anthropomorphic entity. 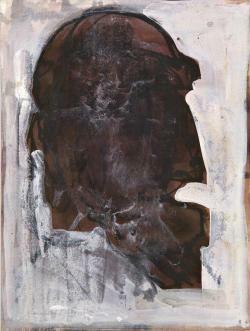 Laying bare her media and their function, Bhabha infuses her work with suggestive narratives. Museum Without Walls stands as both totem and architectural model, creating a contemporary primitivism from cultural refuse. 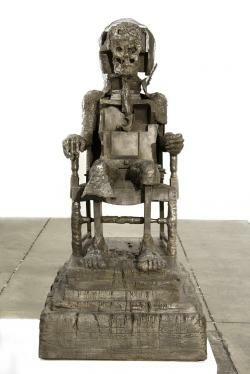 Approaching sculpture as a form of abjection, Huma Bhabha uses found materials combined with moulded components to create an aesthetic that’s equally industrial and barbaric. 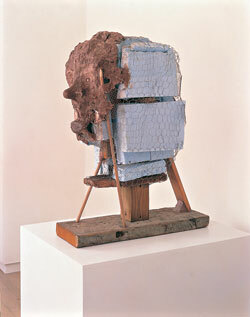 Using the rough hewn tactility of her materials, Bhabha’s work exudes a fragile sensibility; their underlying fictions of lost utopia wittily mirror contemporary anxiety. Bhabha’s Waiting For A Friend towers as a dejected fertility totem. 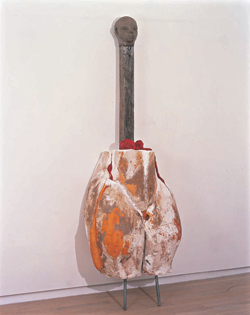 Lingering lonely against the gallery wall, its archaic form swells with expectation: plaster and wax thighs bulging, head exaggeratedly erect, spilled guts on full display. Picturing an upraised hand crudely crafted from impoverished materials and rendered in humble scale, Huma Bhabha’s International Monument is less an icon of peace than a remnant of a forgotten ideal. 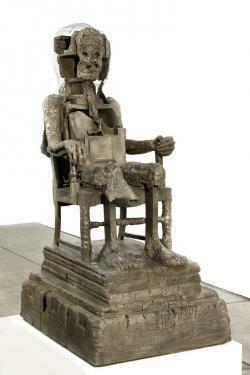 Boldly exhibiting the methods of sculptural process as finished work, Bhabha’s International Monument is conspicuously incomplete in pre-casting form; the potential for bronzed immortality is discarded in preference for the meagre and degradable. 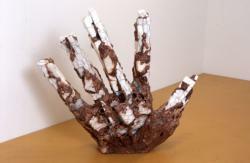 Lumpy crackling clay clinging to flimsy mesh and crumbly Styrofoam creates an intriguing tactility, echoing the fragile nature of the body. Rethinking the authoritarian qualities of ‘monument’ as reflective of the human condition, Bhabha’s sculpture is both destitute and empathetic. Central to Bhabha’s work is the idea that materials embody a kind of mysticism or power that can be activated or enhanced through the artist’s handling. 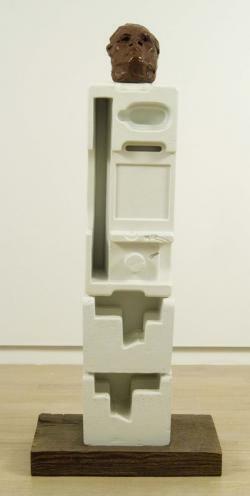 Sell The House is a small sculpture made to the scale of architectural models or museum relics. 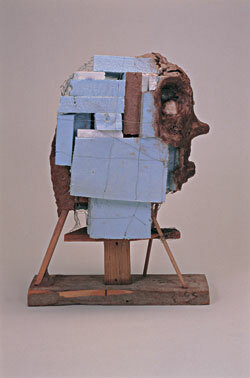 Assembled from construction staples such as wood and bricks the body of her sculpture acts as a ‘foundation’ for embellishment. Utilising the aged and weathered qualities of her materials, Bhabha heightens their totemic connotations by adding clay to create an animistic form or mask. The ‘unfinished’ appearance of the sculpture both exposes the artist’s process of making and the materiality of the construction, framing these as something cryptic, compelling, and haunting. 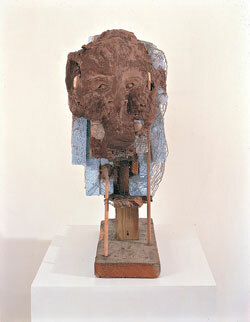 Huma Bhabha is well known for making sculptures from inexpensive media such as Styrofoam, wood, and clay. 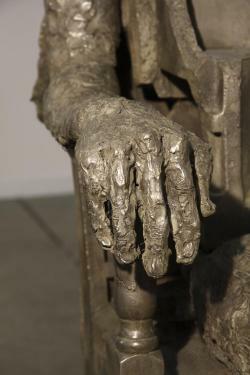 She uses these materials for their immediacy: they are easy to work with and shape, reveal her making processes, and convey a sense of mystery in their ‘ordinariness’; they are also the materials traditionally used in bronze casting to make the ‘original’ of the sculpture for the mould. In A.B. however, Bhabha doesn’t only allude to this process, but follows it through to its ultimate conclusion. 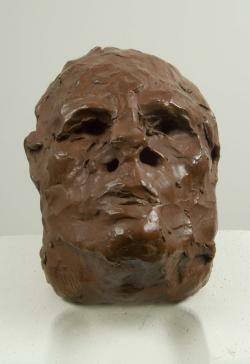 Picturing a clay head crowning a stack of readymade packing, A.B. 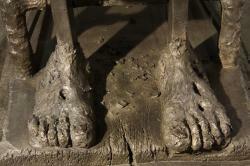 is actually a cast and painted bronze. 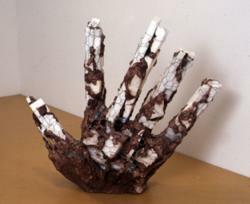 Its surface is uncanny in its detailing: the rough-worked clamminess of clay and gauged and dimpled texture of Styrofoam pose convincingly as the real thing, giving a sense of power and import to the discarded original, and questioning the conventional values of ‘high’ and ‘low’ art. 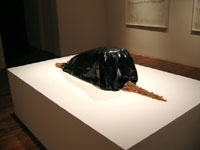 One of the ideals in modernist sculpture was that materials should refute illusionary form: rather than trying to ‘trick’ the viewer into believing that metal or clay might actually be flesh or hair, it was thought that materials should resemble themselves and be material-like. Bhabha draws upon these notions in a contemporary way. Man of No Importance exposes the exact methods of its construction, and the worn and brutal qualities of the materials give the sculpture an aura of ancient ritual and reverence. 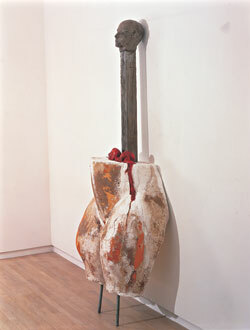 In Bhabha’s work, however, this ‘hallowedness’ is used to humorous effect as her mythological character, made from bits of scrap, becomes the physical embodiment of impoverishment, temporality, and ideological failure. Bhabha’s Untitled Drawing approaches drawing with the physical sensibility of sculpture. 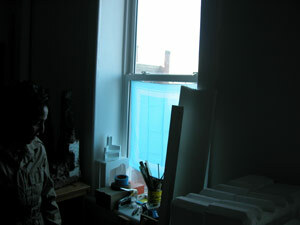 Mounted on board, the image is made more ‘object-like’ than if it were simply on paper. Bhabha uses a variety of media, each imparting their own distinct ‘feel’ and texture: indelible stains of watercolour suggest a poetic fragility underlying thick layers of greasy pastel, opaque ink washes, and gritty graphite residue. Bhabha’s physical process of drawing becomes enhanced through the earthy hues which record the evolution of the piece with a rough, organic aesthetic. The strong contrast of light and dark tones creates a deceptive spatial illusion; the abstract image, reminiscent of a mask, emerges with the three dimensional intensity of sculptural relief. Bhabha’s The Orientalist conveys ideas of exoticism, difference, and otherness. 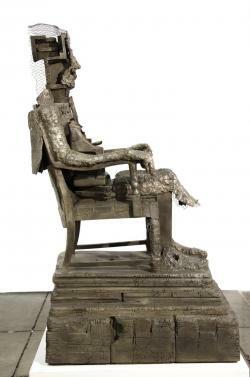 Equally primitive and futuristic, Bhabha’s figure theatrically poses as an ominous king or deity. 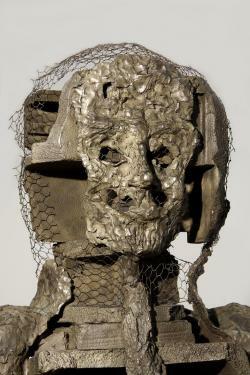 Cast in bronze, it sits as an imposing relic from a fictional history, a regal air emanating from its polished geometric armour, molten death mask, and ethereal chicken wire veil. Humanised through exaggerated hands and feet and sympathetic cartoon styling, its powers waver between the comically surreal and portentously intimidating, drawing narrative suggestion from the loaded clichés of late night science fiction and horror movies.